Yearly, Global Campus students participate and compete in two WSU-wide academic contests—the Showcase for Undergraduate Research and Creative Activities (SURCA) and the Global Case Competition. 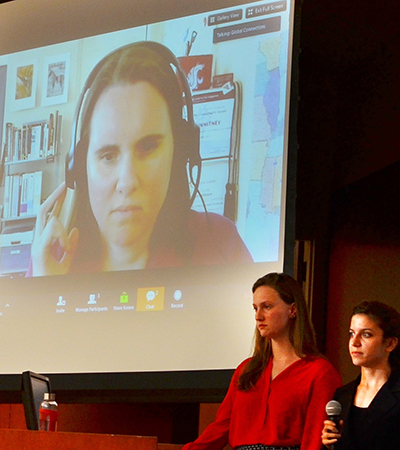 Both events allow students to present their work remotely or in Pullman, WA. By participating in these competitions students have the chance to add unique experiences to their resume, earn scholarship money, and win awards. WSU Global Campus student Kari Whitney presents from her computer in the Global Case competition, April, 2016. Kari and her team, Dignity Before Detention, were crowned champions of the Global Case Competition. Compete to solve a global issue with a multi-disciplinary team of WSU students. The winning team earns accolades and a paid trip to present their solution in the country where their case takes place. WSU Global Campus student (and Crimson Award winner) Rebecca Podszus presents her research, October, 2017. 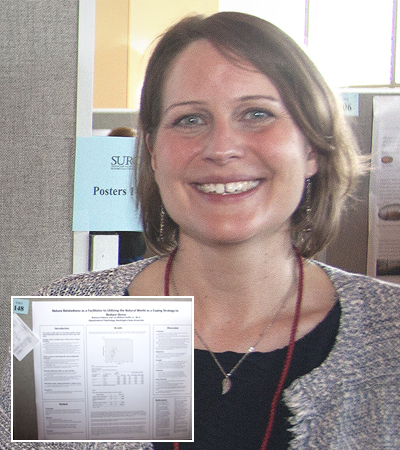 Produce your own original research or creative work under faculty mentorship and present it at the annual WSU-wide poster competition. Winners receive scholarly awards and cash-prizes.